Eighty adult volunteers from two Norfolk Scout Districts came together over the weekend of 26/27 January in Great Yarmouth for a development conference. Delegates for Southern Norfolk (an area that covers Wymondham down to the county border) and South West Norfolk (Thetford, Swaffham and Downham Market area) were welcomed by Graham Woolley, Regional Commissioner for the East of England and Wendy Human, UK Commissioner for Programme Assurance who gave an overview of the UK Scouting Preparing Better Futures strategy and plan. They were followed by County Commissioner, Matthew Burrell who explained Norfolk’s contribution to Preparing Better Futures, and the opportunities that exist for Scouting to continue to grow, be youth shaped, inclusive and have an impact in our communities. During the next two days the delegates focused on their successes and discussed challenges to create action plan to continue the development of Scouting in their patch. Over the weekend a number of Youth Commissioners, volunteers aged between eighteen and twenty five who help ensure that young people shape their Scouting experience through initiative with call ‘You Shape’ and other volunteers supporting You Shape also met to discuss how Norfolk could better support young people shaping their Scouting. They were joined by Suffolk Scouts’ County Youth Commissioner, Ollie Smith who gave an insightful look into the success of You Shape Scouting in Suffolk. Deputy UK Youth Commissioner, Victoria Lawton also took time to support us. The outcome of the weekend was a number of plans and a renewed focus to drive the delivery of Skills for Life to more young people supported by more adult volunteers. 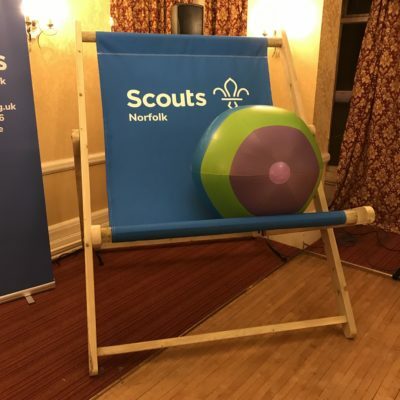 It wasn’t all hard work, Saturday night gave the opportunity for everyone to celebrate successful Scouting with a reception, conference awards, dinner and entertainment. Thank you to everyone who invested time to be with us, setting the vision for the next few years.